How did Reza Aslan Discover the Zealot Jesus? 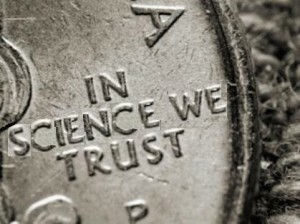 Should We Place Our Trust in Science? Rachel: Guys! Guess what, guess what, guess what, guess what! Our society has a love affair with the idea of science. If you turn on the television, there's always a man in a white jacket telling you how this product will relieve you headache better than any other. Women are sold skin cream that is "doctor recommended." We're always hearing how our kids are falling behind other nations' high test scores in science. If you're from the United States, you may take particular pride in the fact that your nation is the only one to ever put a man on the moon. Science, it seems, is the way we will conquer the plagues of our day. And why shouldn't we hold the highest regard for such a field of study? Look at the advancements that have been made in recent years simply by having scientists investigating and making wonderful discoveries. A prime example is smallpox. Smallpox was a disease unique to humans, afflicting them since 10,000 B.C. It was considered the most dangerous disease through its existence; it's estimated that smallpox killed about 400,000 people every year throughout the 18th century! Many more were blinded or disfigured. It was responsible for more deaths than any other communicable disease. But smallpox was number one in other areas, too. Small pox was the first disease to have a vaccine developed against it. It was also the first disease to be eradicated from the planet through vaccinations. Smallpox is only one example of the many benefits we enjoy as a result of science. The only word to describe the way science has changed the way we live is "amazing." We live at a time unparalleled in human history, a time where we can do things considered unthinkable just a few decades ago. Scientific progress has produced changes as important as increasing our life expectancy or as benign as having an iPod hold 15,000 of your favorite songs. Given that the many advancements we see today can be taken for granted, it may be helpful to step back and get a better perspective of how different life has become. Pick three points in history: say the time of Israel's zenith, the time of the Revolutionary War and today. If we start some three millennia ago when King Solomon was on the throne, we notice that people could only travel as fast as the speed of their horses. The quickest way of communicating with each other over long distances was a message written out and carried by a messenger to the recipient. And their houses and clothing came from natural material that were either gathered or harvested: buildings were built from mud, trees or rock and fabric made from plants such as cotton, animal skins, or wool. Now, let's move the timeline up 3200 years to George Washington's days. People still could only travel as fast as horseback, they could only communicate as fast as a messenger and they still lived and clothed themselves by fashioning what they grew or found around them. But just 200 years later, humans travel at the twice the speed of sound, we communicate routinely at the speed of light, and we go into a laboratory to reassemble molecules and make the materials we want for clothing or construction. In fact, today we do more than lean on science to make our lives easier. We rely on the application of scientific discoveries to survive. Most people wouldn't be able to live through a New England winter if they were forced to use only the technology of the Puritan Settlers. We've simply lost that skill set. This is one reason science holds such high esteem in our culture. You can see how easy it is to make science out to be some type of superhero; and many times our society does just that. People elevate science to the level of a Superman in a white labs coat, able to fix just about anything. We see this portrayed often in popular movies and television shows, such as the original Star Trek series. Creator Gene Roddenberry felt that only science held the answers for mankind, and his vision of the utopian future of Star Trek were the natural outgrowth of scientific achievements. There is no economic system in the Star Trek universe; people explore for the sake of knowledge alone. There is no more class warfare, bigotry, or any of the social ills that plague us today. Science has wiped them all out. Of course, the real world is a much different story than Hollywood, where one can craft a tale that leaves out the realities of the human condition. The real world has shown that people are sinful, and that fact pervades all aspects of our lives. Scientists are not immune to bias, deceit, greed or the quest for fame and power any more than the rest of us. In fact, scientists ARE the rest of us! They're just people. You see, science really doesn't tell us anything—scientists do. Science is a field of study people take to learn more about their world. And as long as the world gets its science from scientists, we will also need to caution ourselves against imbibing "science" with virtues that it doesn't hold. 2. I first heard this comparison from a tape study from Calvary Chapel Costa Mesa. Since it's been many years, though, the original source remains elusive. If anyone trusts science or has a love affair with science, then they're doing it wrong. The whole point of science is to doubt and question, to check and double-check, to investigate and keep searching. This is the opposite of trust and love. If you trust science, then it's not really science. It's your own lazy ignorance. If you're in love with science, then it's not really science. It's the materialistic fruits of other people's science perhaps. Science is not bringing anything into being; only discovering the pre-existing creation-actually learning more about God! It takes some trust in science to spend millions ($400 million USD) to put a robot rover on Mars... and it paid off! Try that with something else better than science. You can't pray or hope that kind of stuff into existence. Gee, Bernie. it sounds like they really have some.. oh, what's the word?.. FAITH that they will succeed! RE: "Scientists are not immune to bias, deceit, greed or the quest for fame and power any more than the rest of us." Actually, there are some mechanisms in the scientific method and thinking to rule out subjectivity (such as double-blind testing) and presuppositional bias (confirmation bias). These are serious problems that theologians have, and rather than root them out, they think it is some sort of badge of honor to instead have faith in the face of conflicting evidence. RE: "Gee, Bernie. it sounds like they really have some.. oh, what's the word?.. FAITH that they will succeed!" Yes- I'm a strong supporter of evidence-based faith. I can give you an example where your faith is not evidence-based. I think you believe that Noah's Ark story is really true, either global or local flood. But the evidence is obvious there was no global or local flood that wiped out all humans except those saved on an ark. Tell us about Noah's Ark, and your faith will be shown to be based on total nonsense. This is why theologians avoid the discussion like the plague.